Fleur Stevenson is a New Zealand abstract artist, whose work is inspired by the patterns, textures and shapes found among the urban surroundings of Sydney’s Inner West. Working with mixed media (acrylic and spray paint) on canvas and board, Fleur’s paintings explore the negative spaces between (permanent and temporary) objects and invite the viewer to discover and navigate through these seemingly empty spaces. 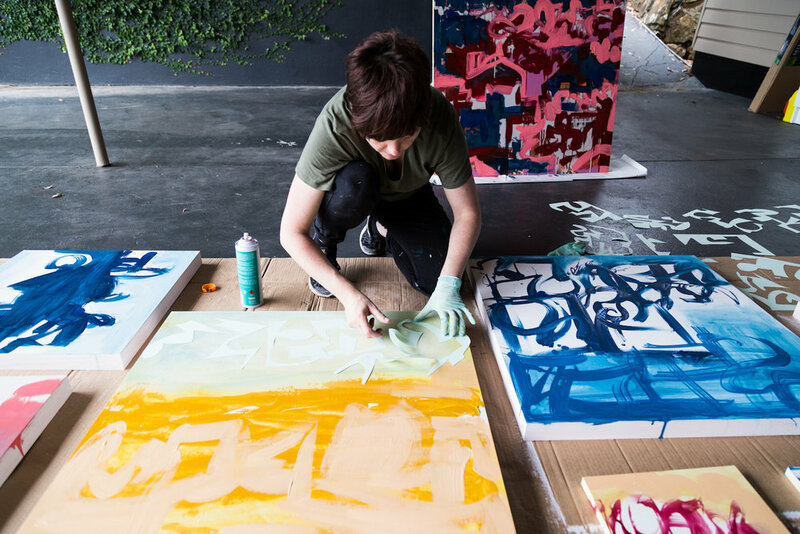 A recent move to the inner-city suburb of Rozelle has inspired her latest collection of work - a series of 20 x 20cm and 50 x 50cm paintings on board, that play with pattern and repetition, balancing and unbalancing geometric shapes, contrasting and complementary colours, and creating depth and perspective by layering spray painted stencils and acrylic paint. Inspired by artists like Ben Quilty, Anthony Lister, Colin McCahon and Rachel Whiteread, Fleur’s work explores themes of interconnectedness, cultural dynamics and a sense of place, with the aim of bringing attention and focus to areas of the everyday environment that are often overlooked. Born in New Zealand 1976, Fleur moved to Melbourne in 1998, where she completed Visual Arts studies at 2001 and was the artist in residence at The Foundry, North Fitzroy between 2004 and 2005. More recently her work has been exhibited as part of the Inner West Open Studio Trail, Balmain Library and at Balmain Space.